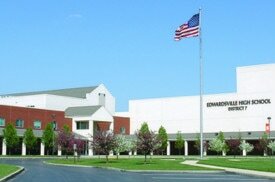 University Edwardsville and the Lewis and Clark Community College N.O. Nelson Campus, both of which are active educational partners with the school district. years. District 7’s growth has resulted from people moving to here from neighboring communities and relocating into the region from across the country. Area real estate agents steer their clients to the Edwardsville & Glen Carbon area because of its reputation as a strong community with an equally strong school system. a new high school in 1997 and an additional middle school in 2003. In 2008, the district opened three new elementary schools and completed major expansion and renovations to two additional buildings. With its core campus in Godfrey, IL, Lewis and Clark Community College is a two-year higher education institution with multiple campuses, including the N.O. 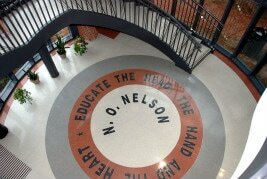 Nelson campus in Edwardsville. Lewis and Clark Community College also operates a river research center, Community Education Centers and training centers located throughout the 220,891-person college district, which reaches seven counties. successful preservation initiatives in Illinois. A standout among Illinois community colleges, Lewis and Clark is a state and national award-winning community college that has achieved 16 consecutive years of enrollment growth, a 70-plus percent increase in credit students and the longest continuous growth trend in the state. Lewis and Clark offers 43 associate degrees and numerous certificate and transfer options, as well as a nationally accredited dual-credit program for high school students; GED completion; and the largest work force training program in the state of Illinois. Fourteen colleges and universities also offer bachelor’s and master’s degrees on Lewis and Clark’s campus. Through a partnership among Lewis and Clark, the University of Illinois and the Illinois Natural History Survey, the National Great Rivers Research and Education Center provides scientific advances and educational opportunities in river research and leads the way in sustainability. A new state-of-the-art, green Field Station, dedicated in fall 2010, is seeking LEED Platinum certification with its own solar, wind and hydro-kinetic systems; internal and external water recycling systems; a vegetative roof; and more. Lewis and Clark is dedicated to public engagement, from 'greening' the campus, reducing the college’s carbon footprint, and providing technical assistance in sustainable practices and education to delivering affordable health care to underserved populations throughout the district through a Mobile Health Unit and a federally funded Family Health Clinic, currently the only nurse practitioner clinic operated by a community college. Since it opened in 2008, the Family Health Clinic has served more than 33,584 people in the community. 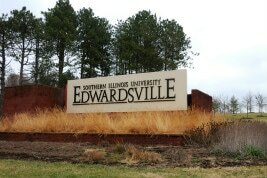 SIUE is a public comprehensive university offering a broad choice of degrees and programs ranging from career-oriented fields of study to traditional liberal arts. SIUE offers programs that match the needs of the metropolitan area it serves, awarding degrees in 44 undergraduate programs and 69 graduate and professional practice programs. In addition, students may enroll in 55 undergraduate minors and complete the requirements for teacher certification. Programs are offered through seven academic units: the College of Arts and Sciences and the schools of Business, Dental Medicine, Education, Engineering, Nursing and Pharmacy. The School of Pharmacy admitted its first class in the fall 2005 and awarded Doctor of Pharmacy degrees for the first time in 2009. SIUE is home to more than 14,200 undergraduate and graduate students and a faculty of more than 600. Some 3,000 degrees are awarded each year. More than 90,000 individuals call SIUE their alma mater. With a student-to-teacher ratio of 17-to-1, SIUE offers the advantages of a small, liberal arts college with the lowest tuition and required fees of all four-year institutions in Illinois. For the third consecutive year, SIUE was cited by its peers and reported in U.S.News & World Report’s Best Colleges of 2012 as an "up-and-coming school.” SIUE is listed as one of seven Midwestern regional universities — one of only three public institutions — that has recently made “innovative changes in the areas of academics, faculty, student life, campus life and facilities.” The “up-and-coming” category includes a total listing of 46 colleges and universities (only 17 public institutions) throughout the country. U.S.News & World Report’s Best Colleges of 2012 lists SIUE among the top 15 public universities in its 'Best Regional Universities Midwest' (master’s granting) category for the eighth consecutive year. The overall scores are based on the academic preparedness of students, graduation rates, faculty characteristics and the reputation of SIUE in higher education. For the second consecutive year, Washington Monthly, a national magazine, ranks SIUE among the top 50 master’s-granting colleges and universities in the nation; SIUE is 13th among public institutions on that list. Ratings are based on institutions’ commitment to the public good in three broad categories: Social Mobility, Research & Service. In fiscal year 2011, SIUE faculty and staff received more than $34 million in grants and contracts for research, teaching and service initiatives.